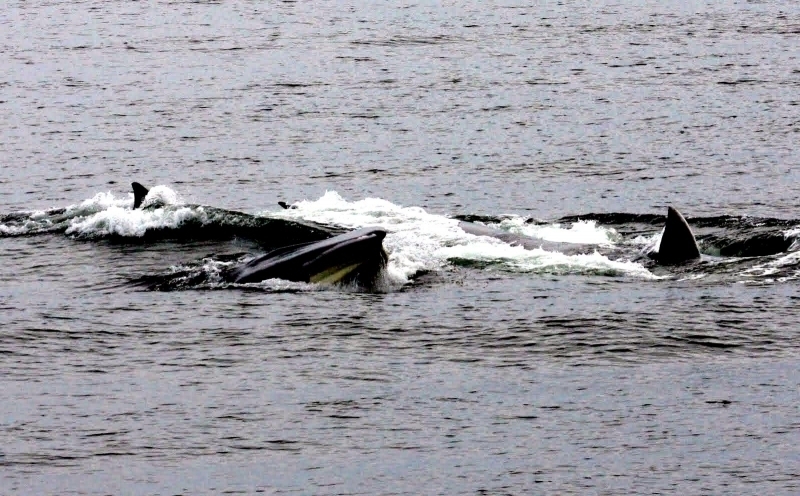 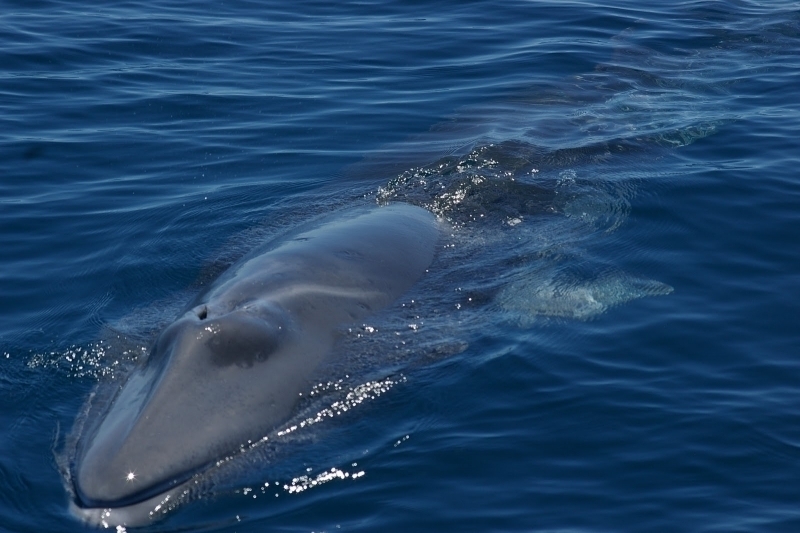 The Fin Whale also known as the Finback Whale is one of the rorquals, a family that includes the Humpback, Blue, Bryde’s, Sei and Minke Whales. 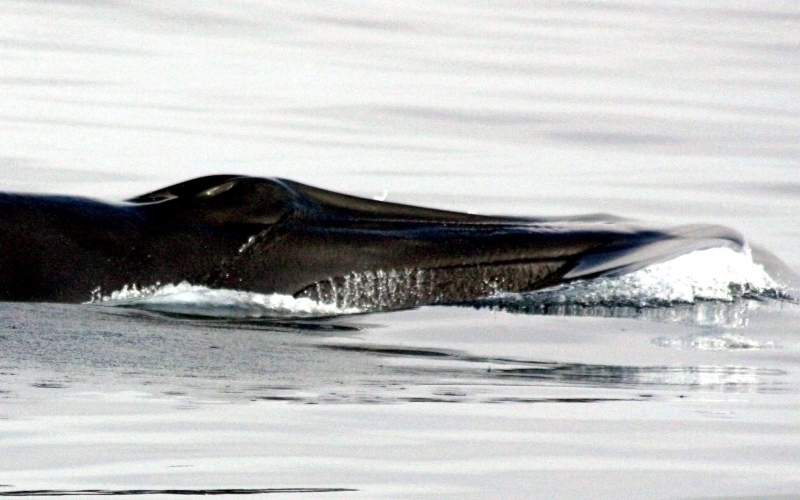 Rorquals all have a dorsal fin & throat grooves that expand when the animal is feeding. 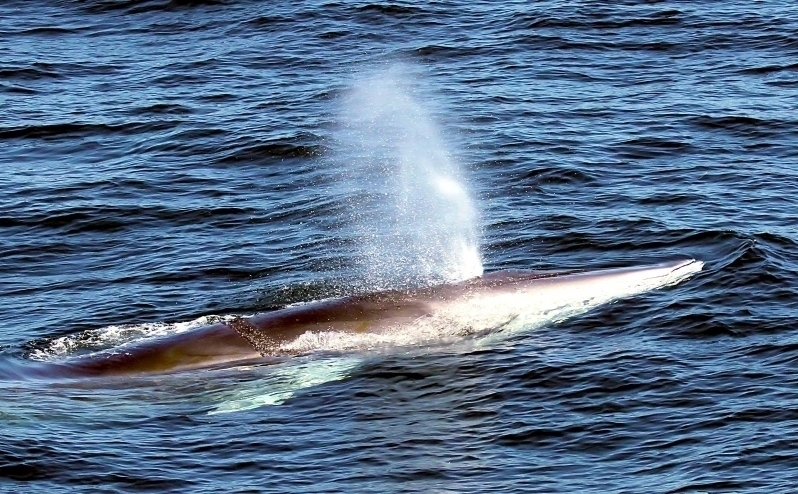 The Fin Whale is second only to the Blue Whale in size & weight and is the fastest of the great whales, capable of bursts of speed of up to 23 mph leading to its description by American naturalist Roy Chapman Andrews calling the Fin Whale “the Greyhound of the Sea” for its beautiful, slender body that was built like a racing yacht and the fact that the animal could surpass the speed of the fastest ocean steamship. 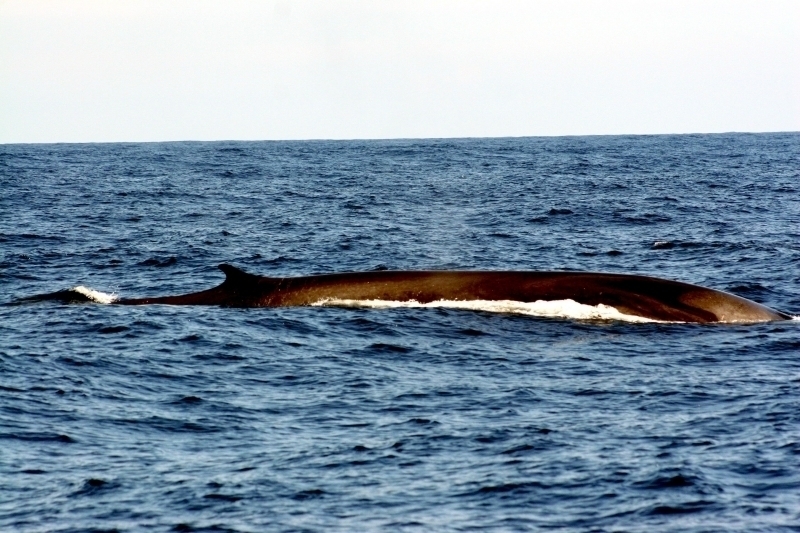 The Fin Whale gets its name from the fin on its back that is near the tail which is very easy to see. 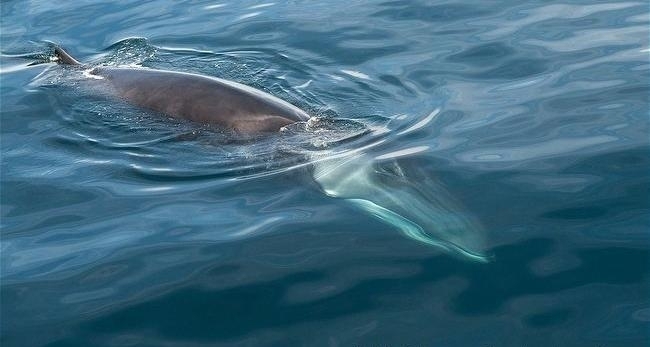 Its most unusual characteristic is the asymmetrical coloring of the lower jaw, which is white or creamy yellow on the right side and mottled black on the left side. 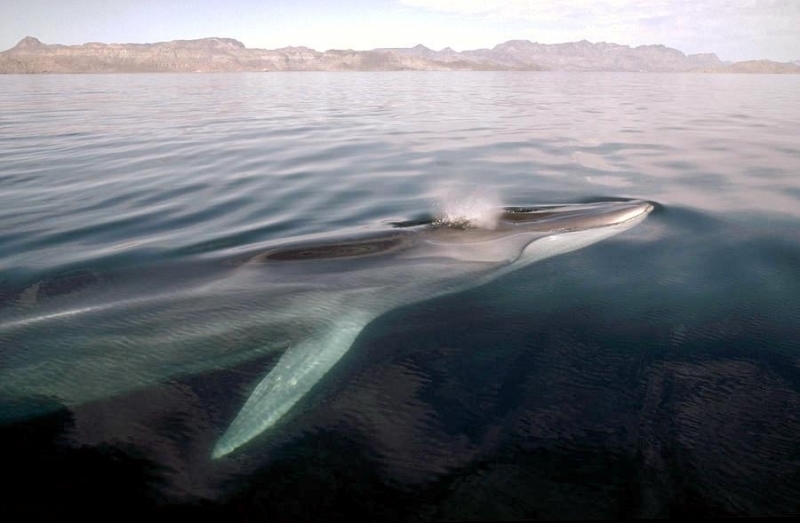 Fin Whales are found in all oceans of the world, though they seem to prefer temperate and polar waters to tropical seas. 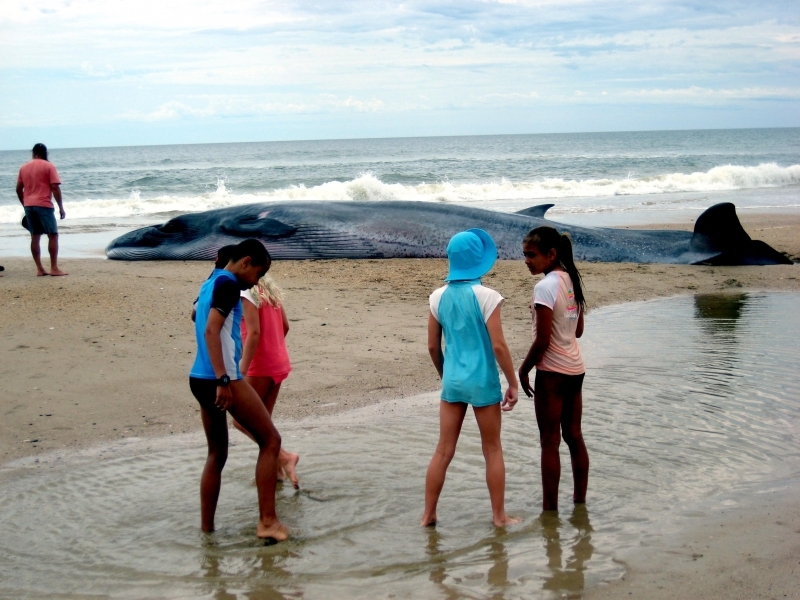 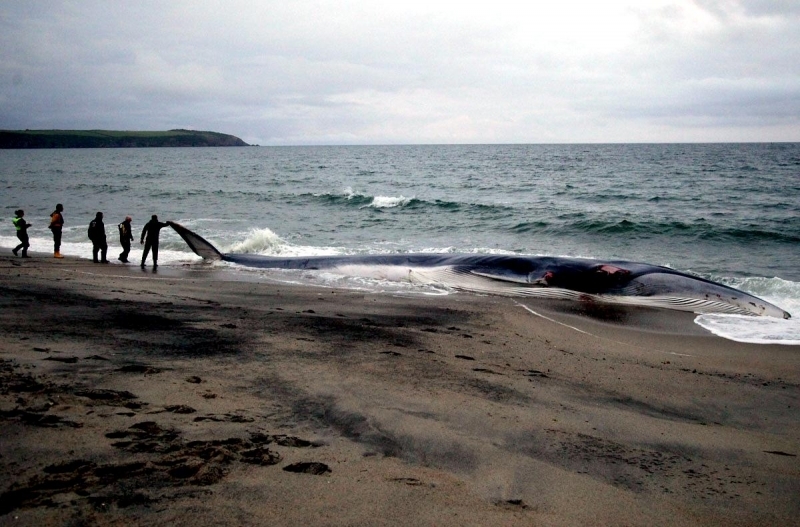 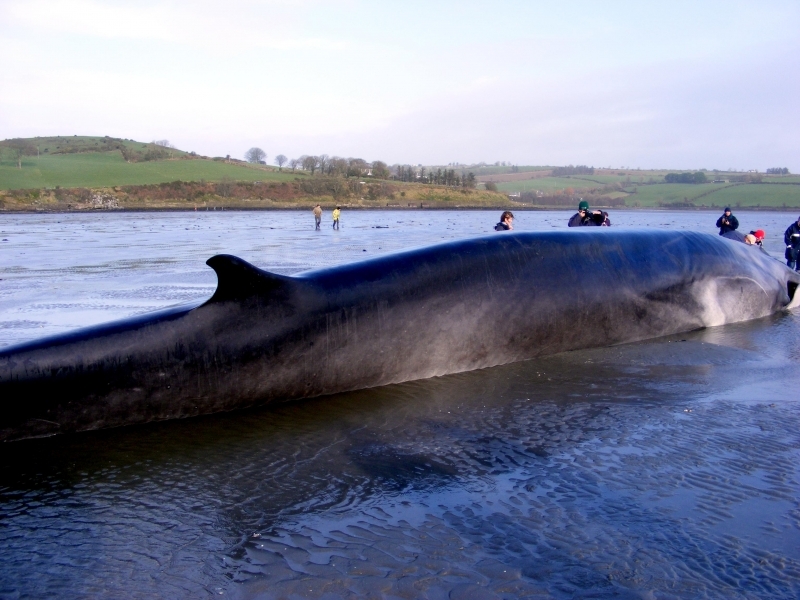 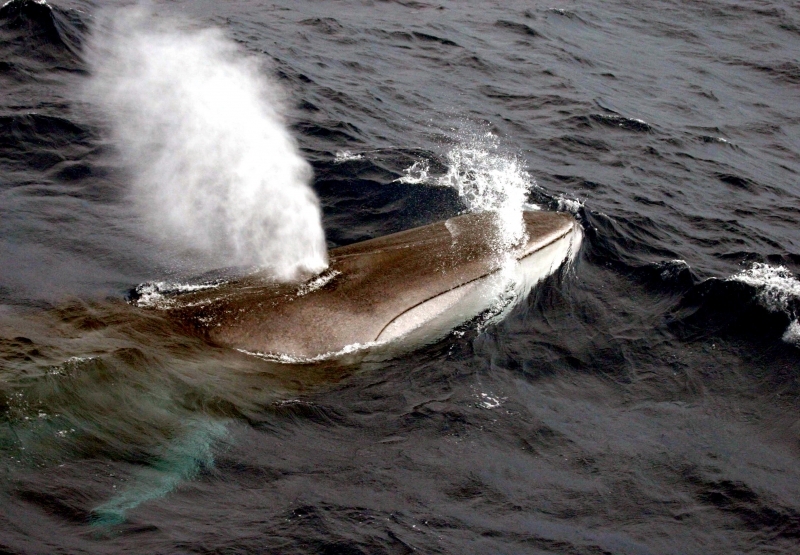 The Fin Whale is long, sleek and streamlined with a V-shaped head which is flat on top. 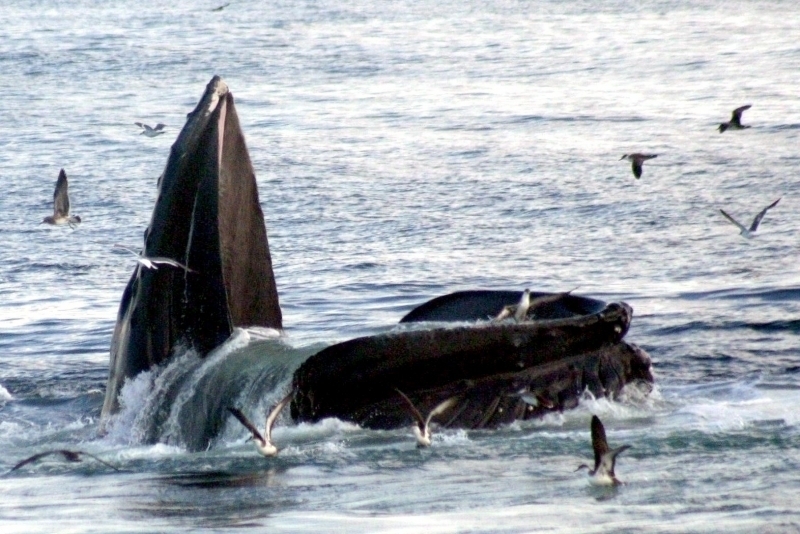 A single ridge extends from the blowhole to the tip of the rostrum (upper jaw). 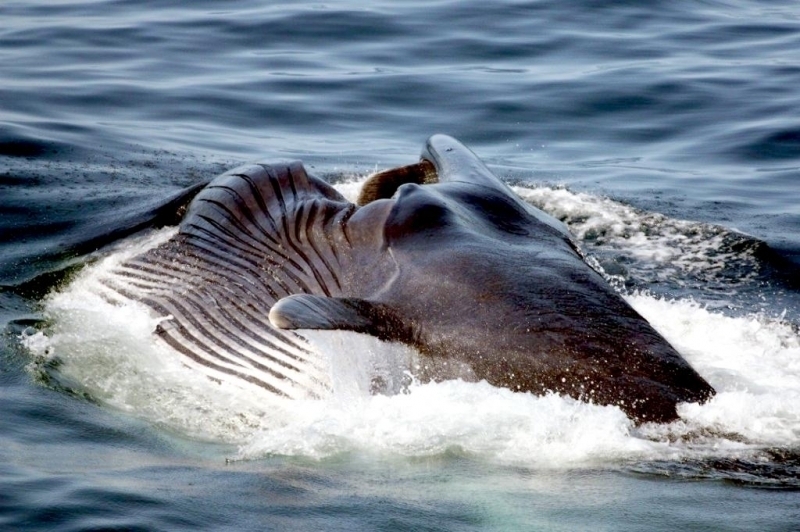 There is a series of 50-100 pleats or grooves on the underside of its body extending from under the lower jaw to the navel. 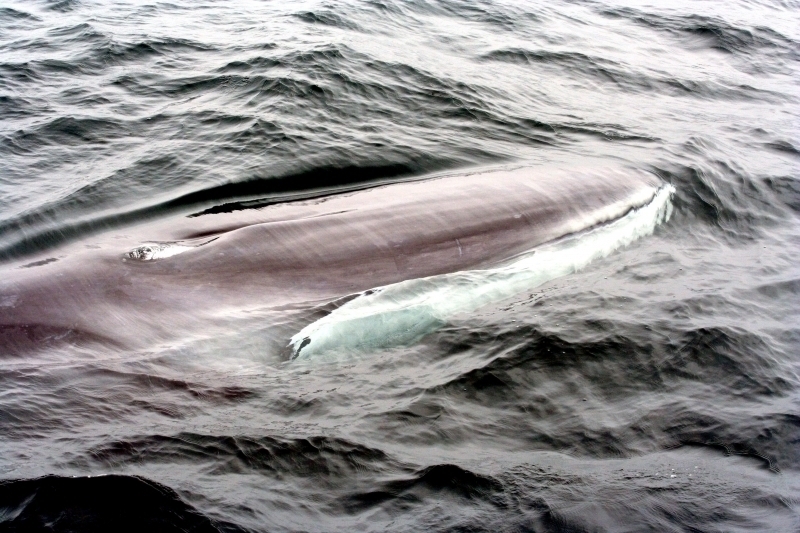 The Fin Whale is light gray to brownish-black on its back and sides. 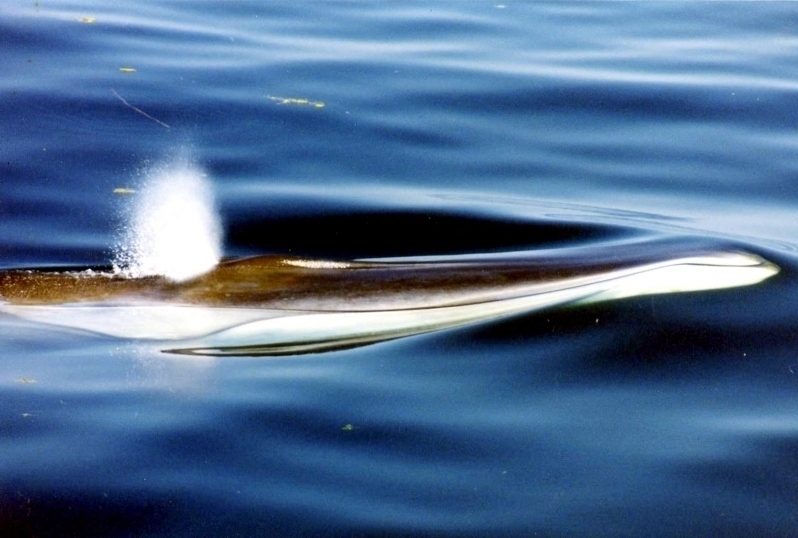 Two lighter “colored” chevrons begin mid-line behind the blowholes and slant down the sides towards the fluke (tail) before turning and ending right behind the eye. 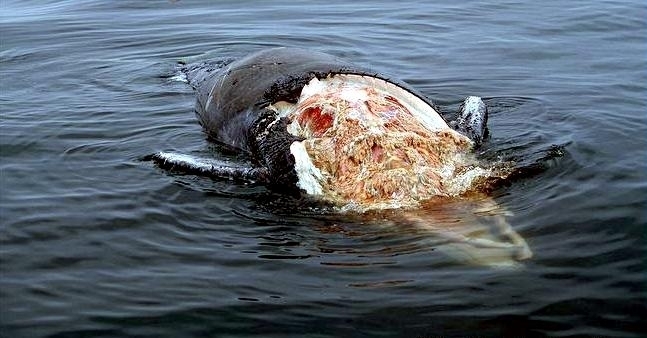 The underside of its body, flippers & fluke are white. 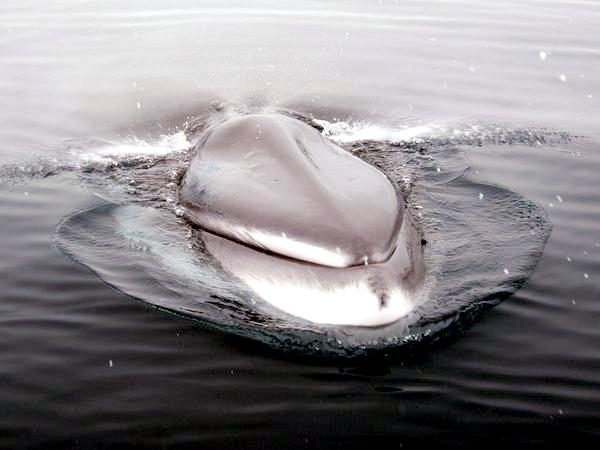 The lower jaw is gray or black on the left side and creamy white on the right side. 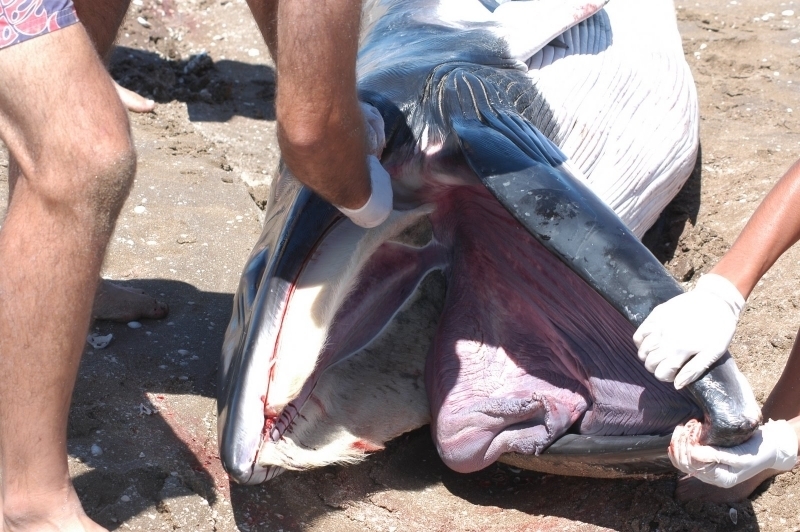 This asymmetrical coloration extends to the baleen plates as well and is reversed on the tongue. 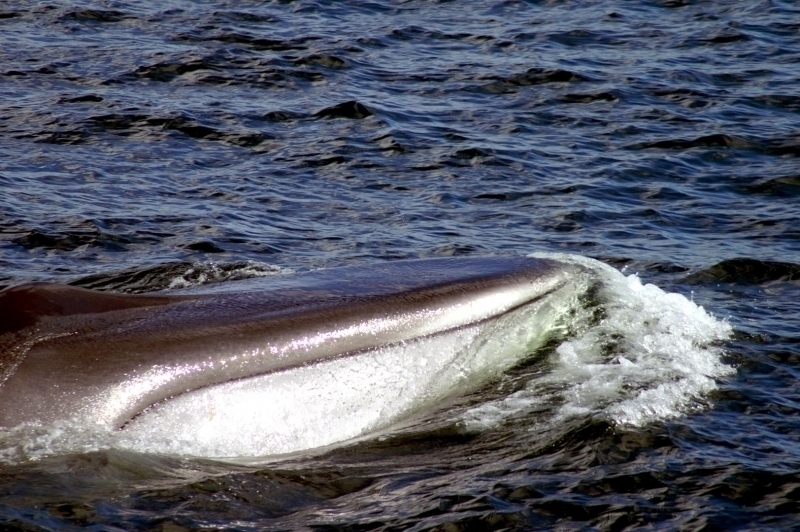 The Fin Whale has a prominent, slightly falcate (curved) dorsal fin located far back on its body. 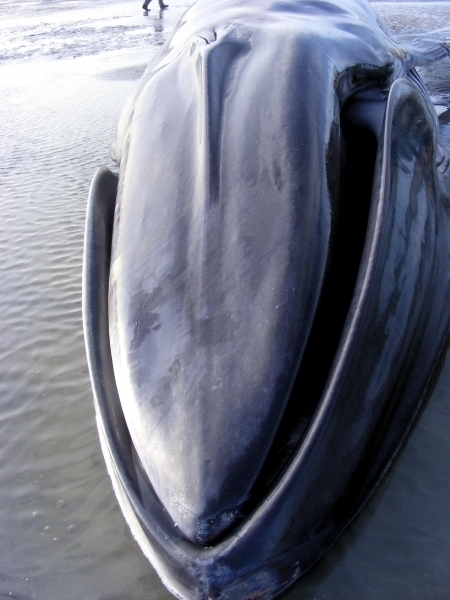 Its flippers are small & tapered and its fluke is wide, pointed at the tips and notched in the center. 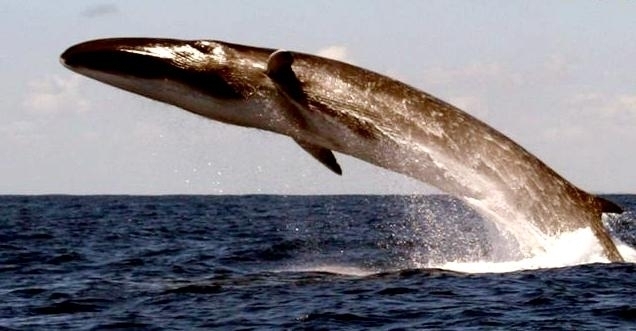 Adult males measure up to 78 feet in the northern hemisphere and 88 feet in the southern hemisphere. 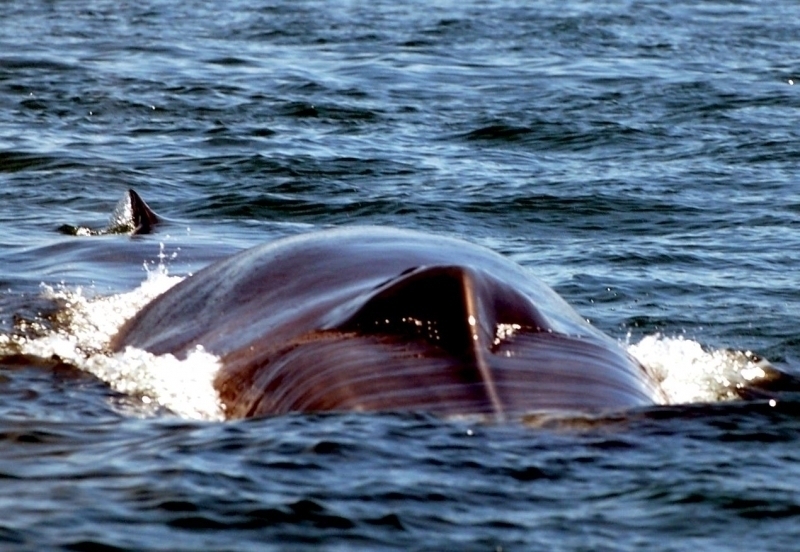 Females are slightly larger than males and the weight for both sexes is between 50-70 tons. 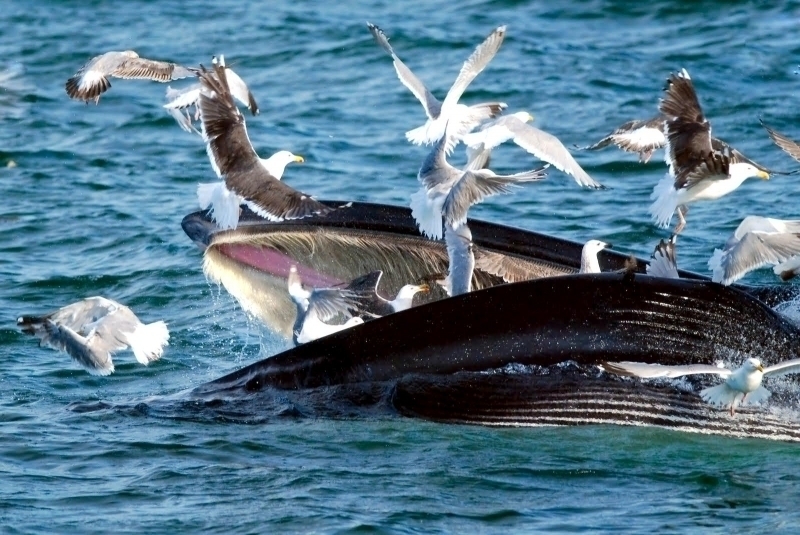 They feed mainly on small shrimp-like creatures called krill or euphausiids and schooling fish. 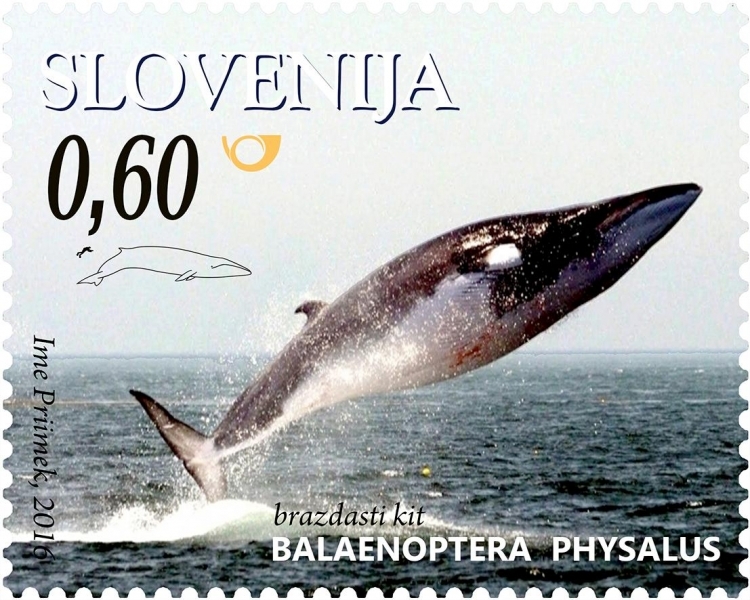 They have been observed circling schools of fish at high-speed, rolling the fish into compact balls then turning on their right side to engulf the fish. 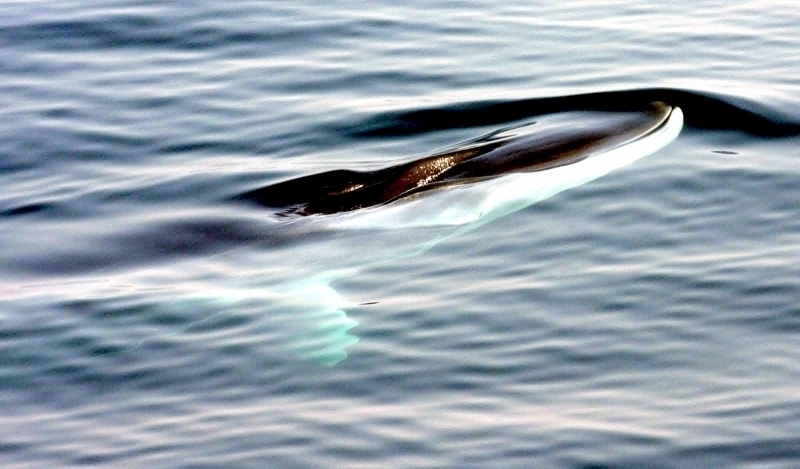 Their color pattern, including their asymmetrical jaw color, may somehow aid in the capture of such prey. 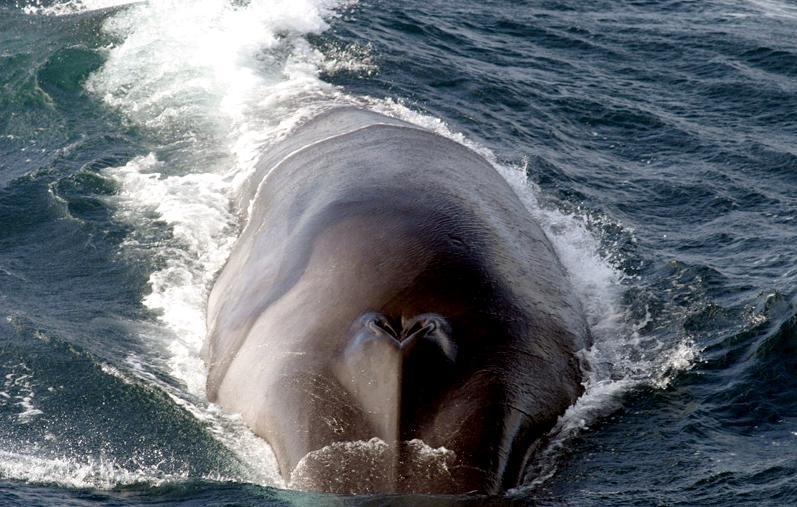 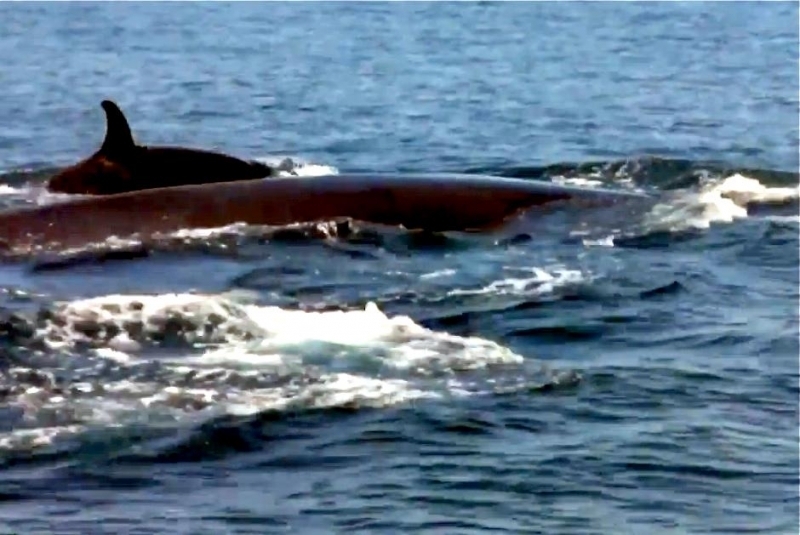 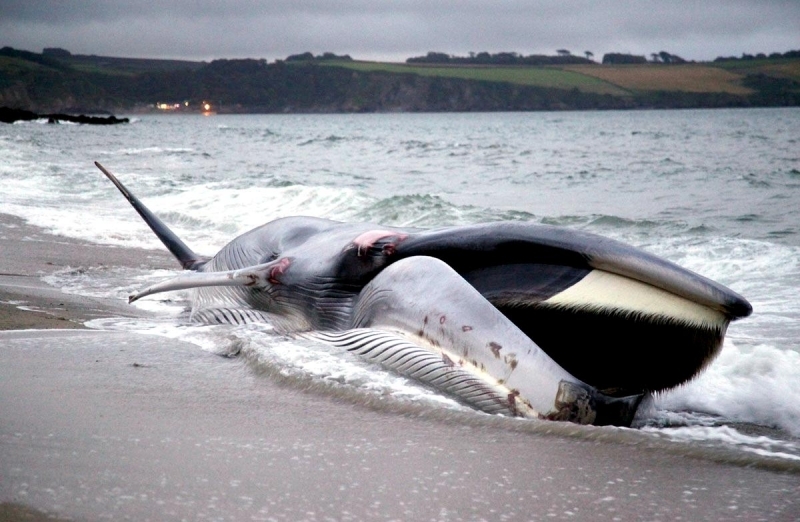 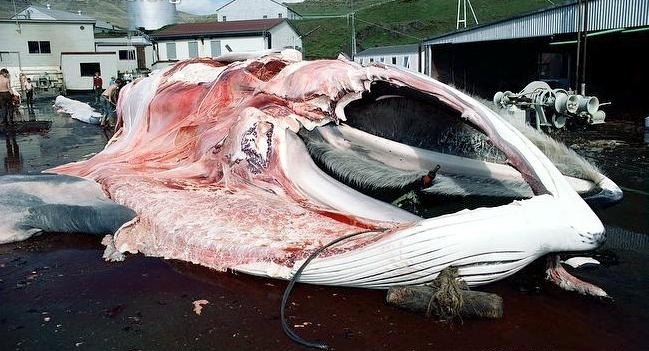 Fin Whales can consume up to 2 tons of food a day. 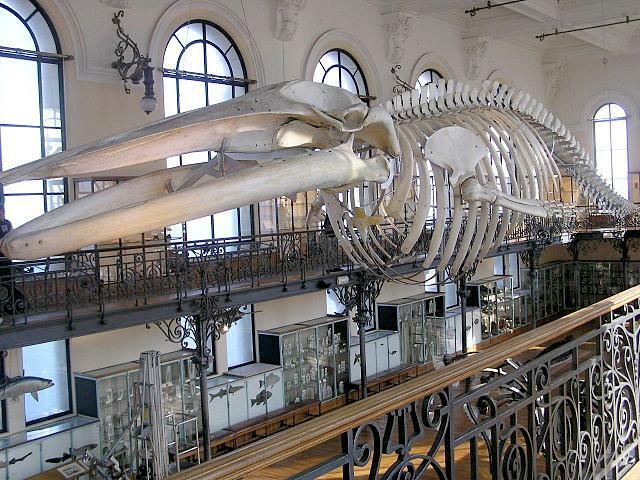 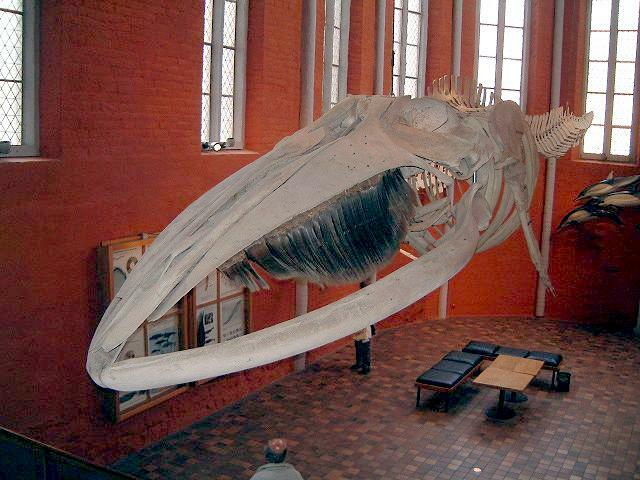 As a baleen whale, it has a series of 262-473 fringed overlapping plates hanging from each side of the upper jaw, where teeth might otherwise be located. 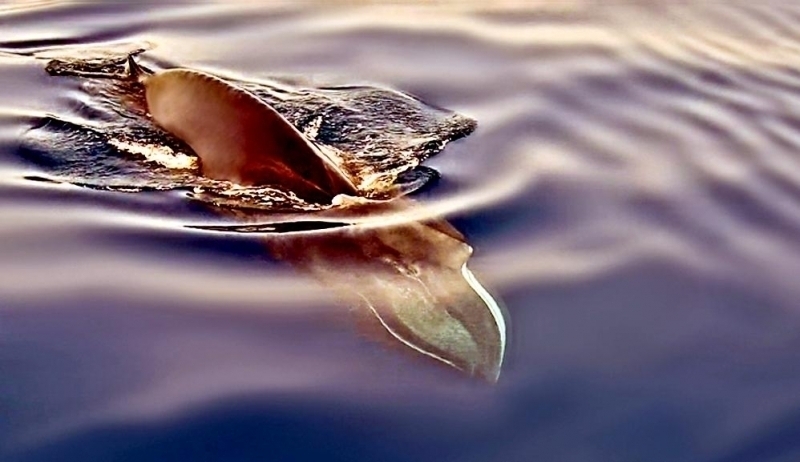 These plates consist of a fingernail-like material called keratin that frays out into fine hairs on the ends inside the mouth near the tongue. 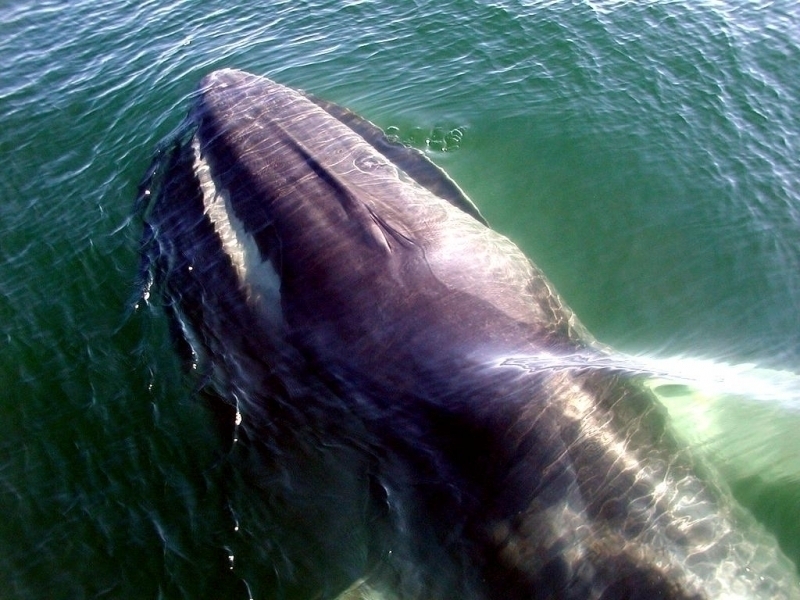 The baleen on the left side of the mouth has alternating bands of creamy-yellow and blue-gray color. 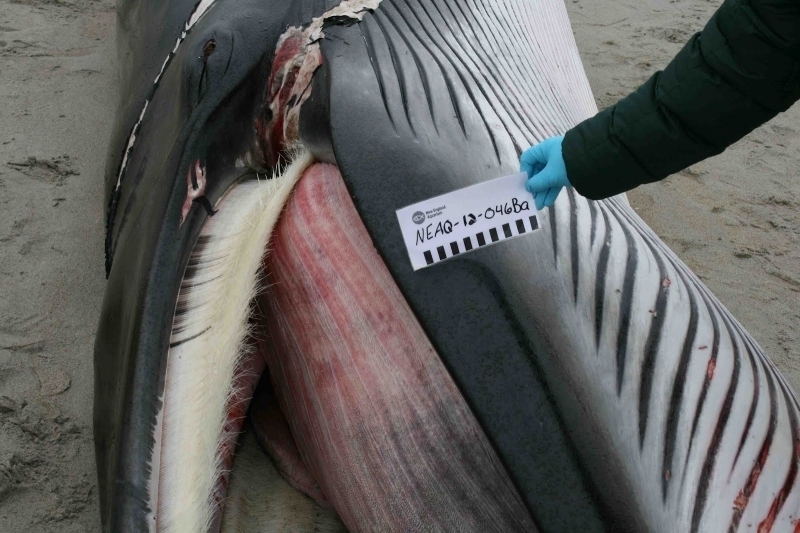 On the right side, the forward 1/3 section of the plates is all creamy-yellow. 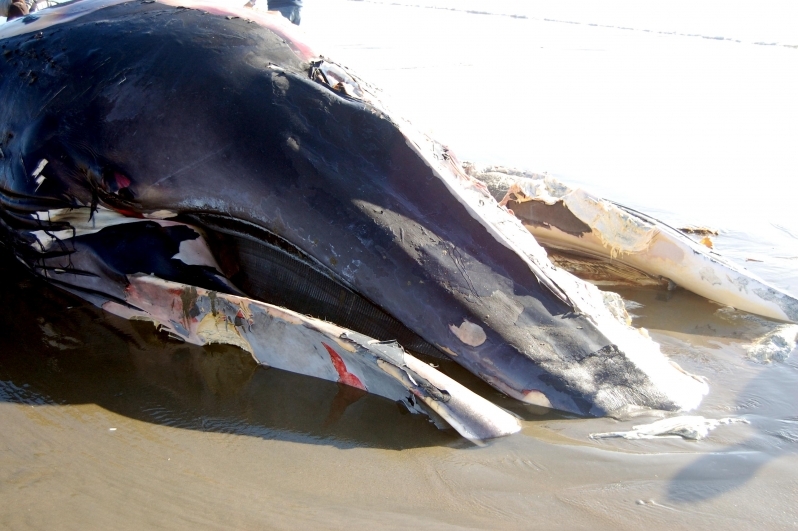 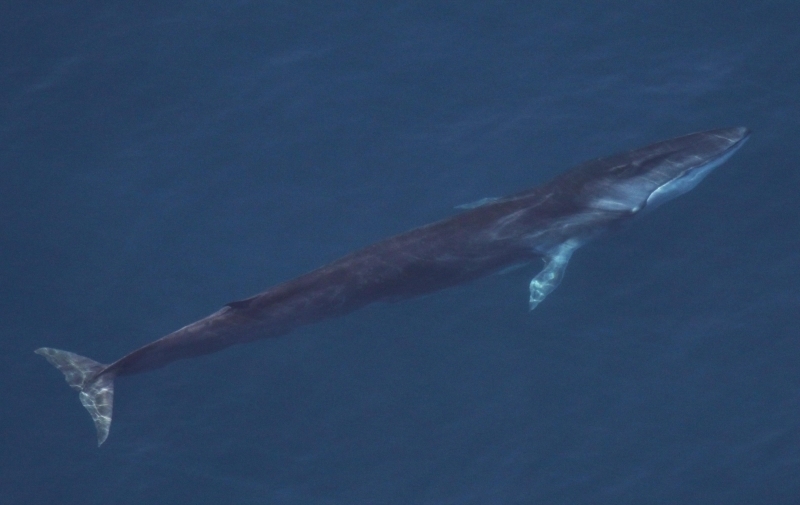 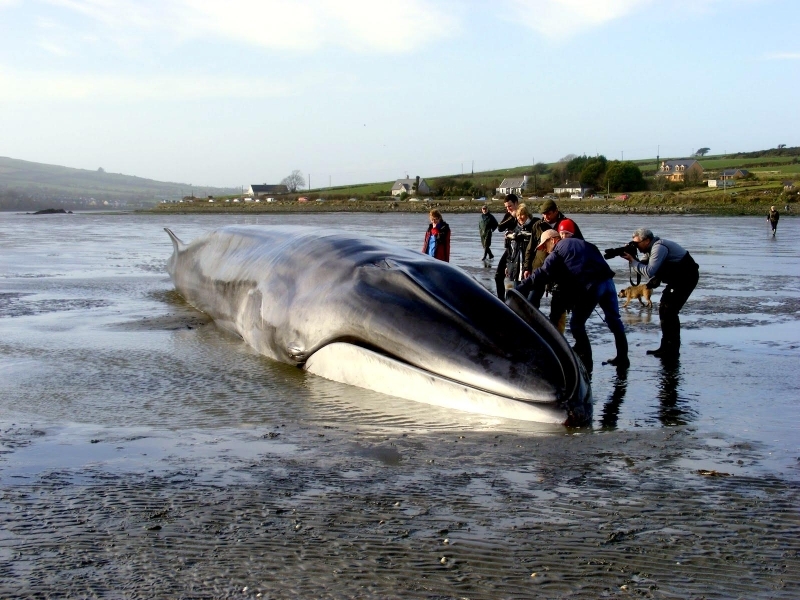 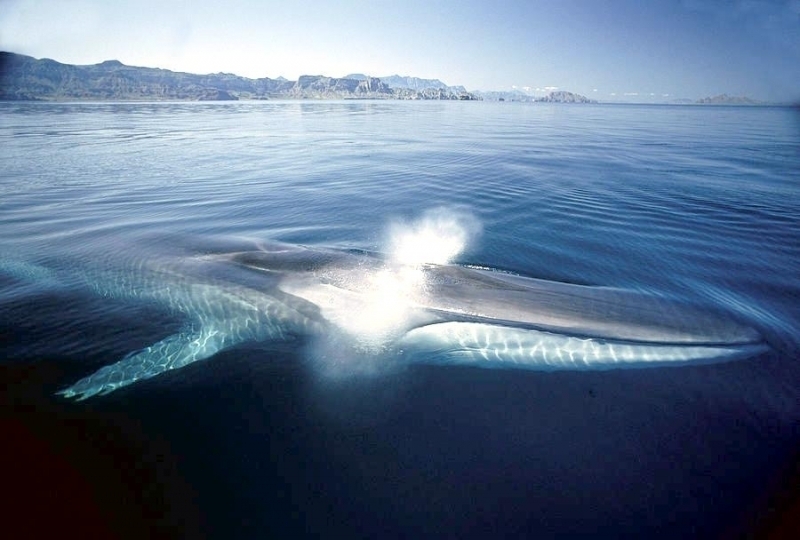 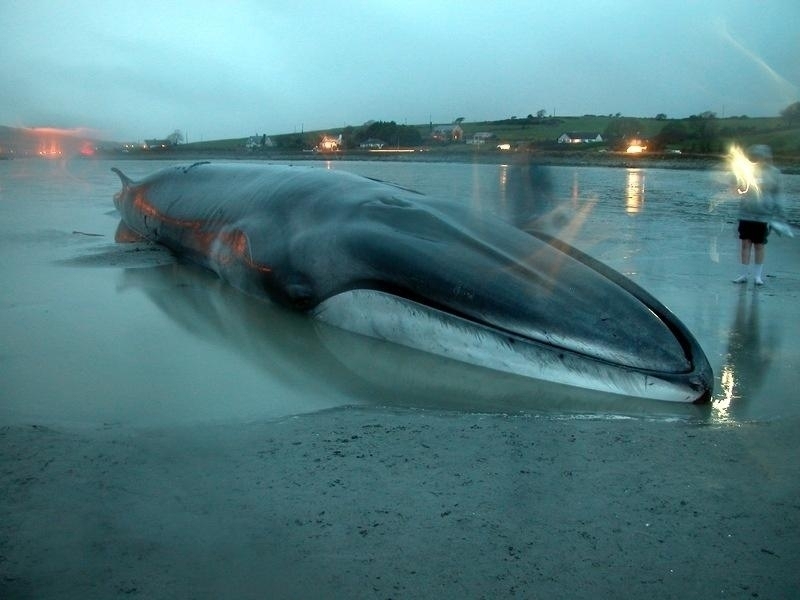 The plates of the Fin Whale can measure up to 30 inches in length and 12 inches in width. 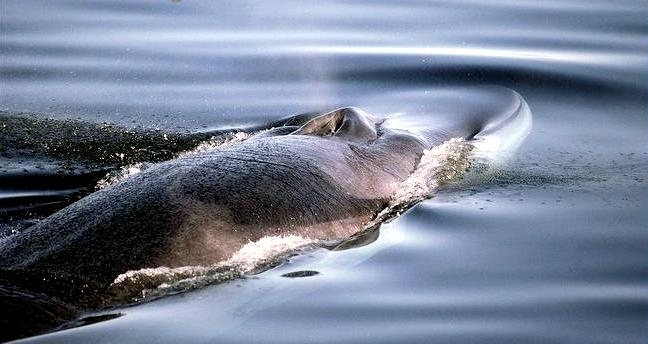 During feeding, large volumes of water & food can be taken into the mouth because the pleated grooves in the throat expand. 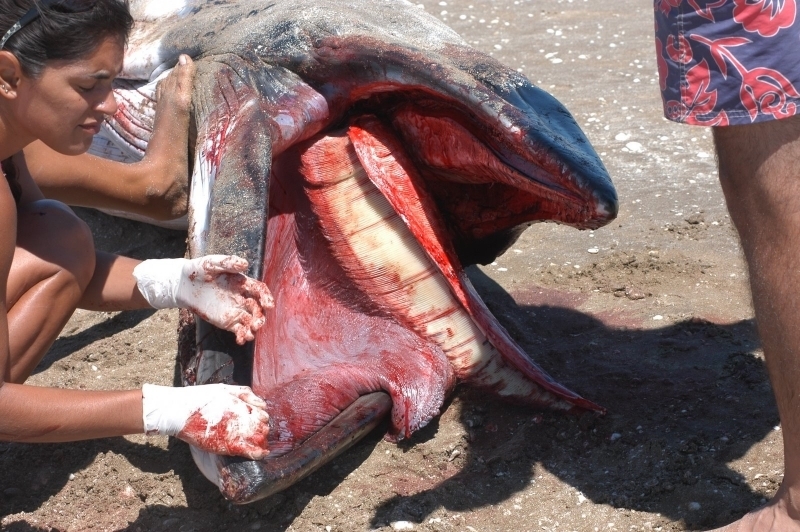 As the mouth closes water is expelled through the baleen plates, which trap the food on the inside near the tongue to be swallowed. 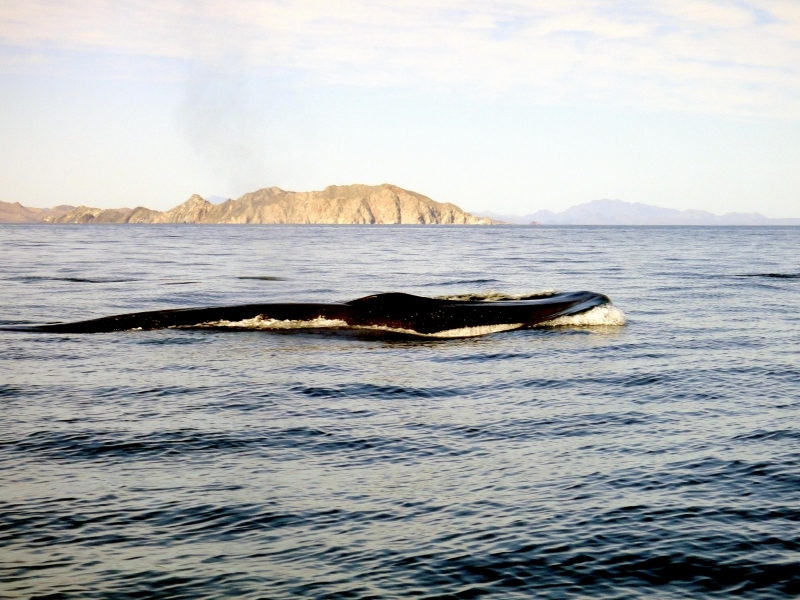 Adult males reach sexual maturity at about 6-10 years of age. 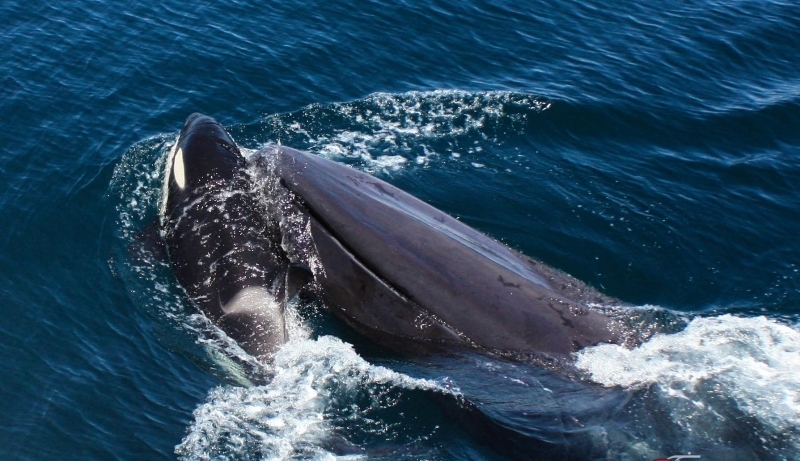 As in some other whales, sexual maturity is reached before physical maturity. 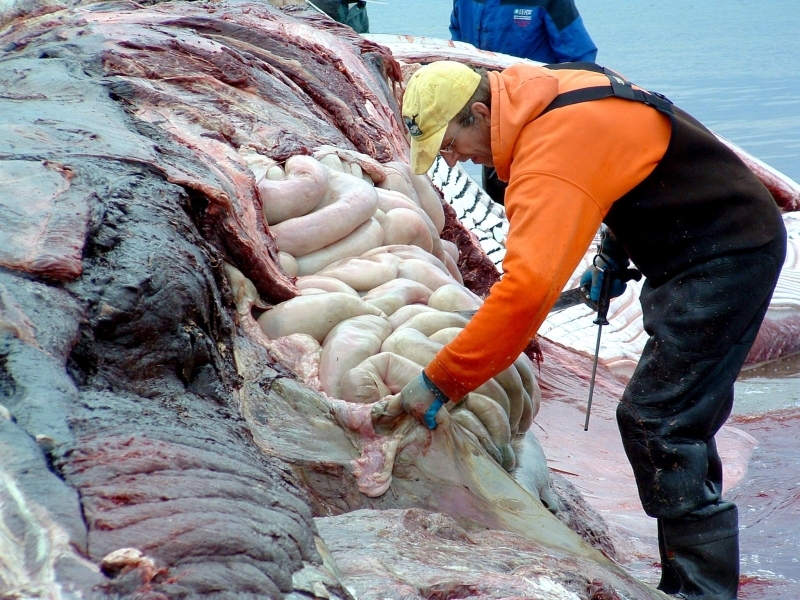 Gestation is 12 months and calves are believed to be born at 3-4 year intervals. 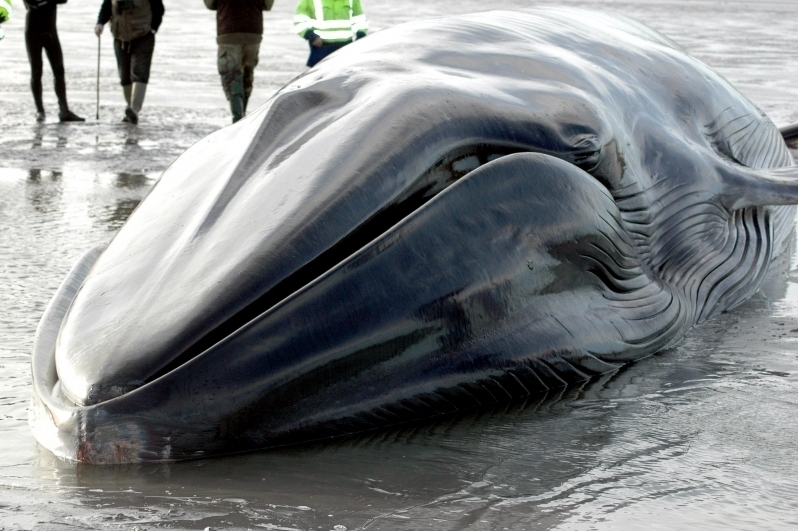 Length at birth is 14-20 feet and weight is 2 tons. 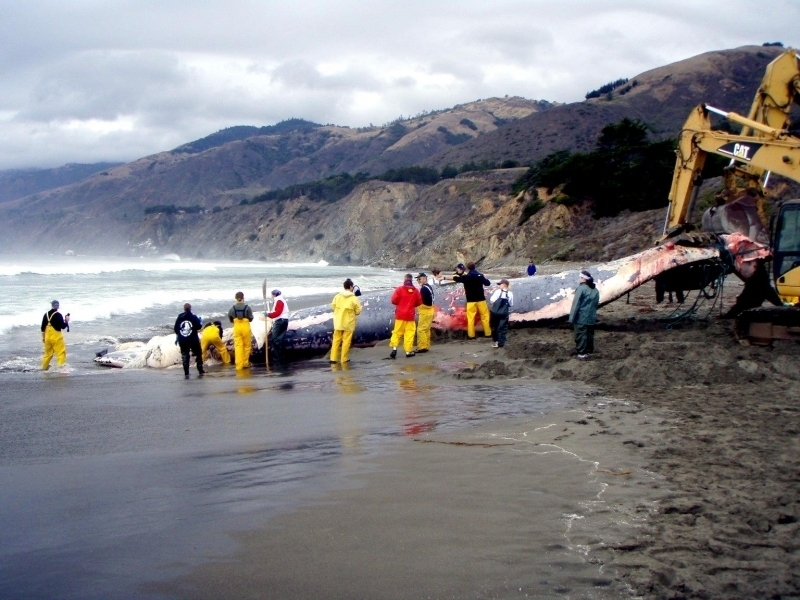 Calves nurse for 6-8 months and are weaned when they are 30-40 feet in length. 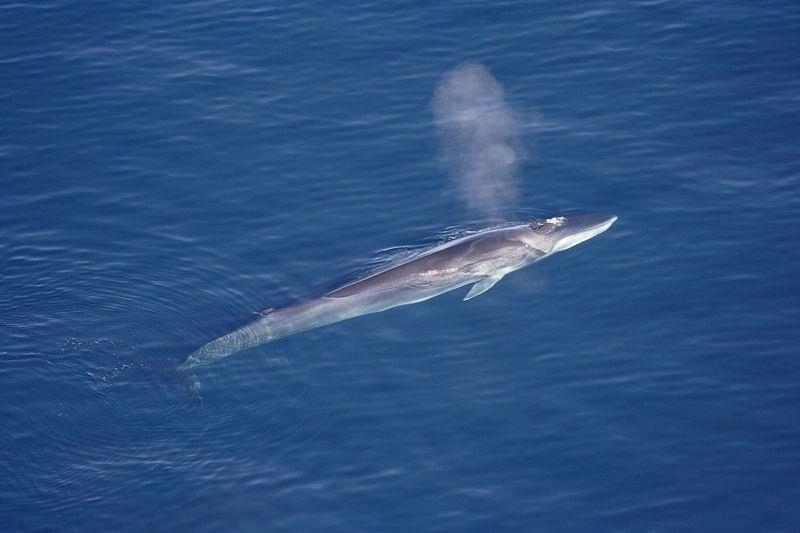 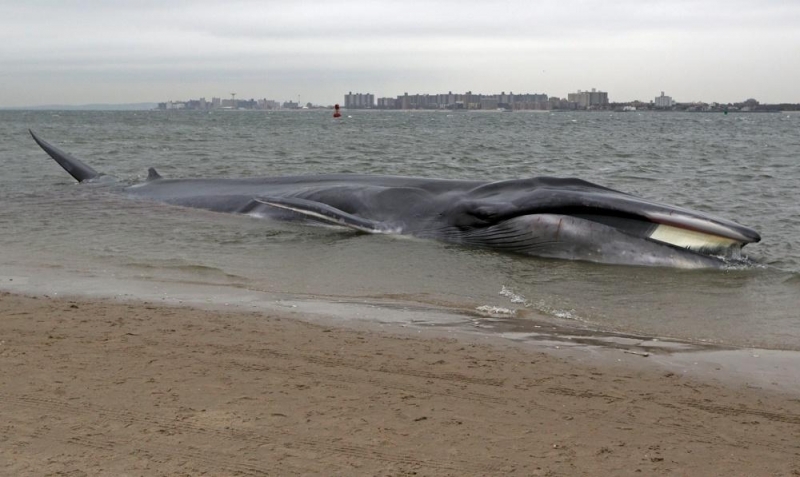 Fin Whales are found in all oceans of the world. 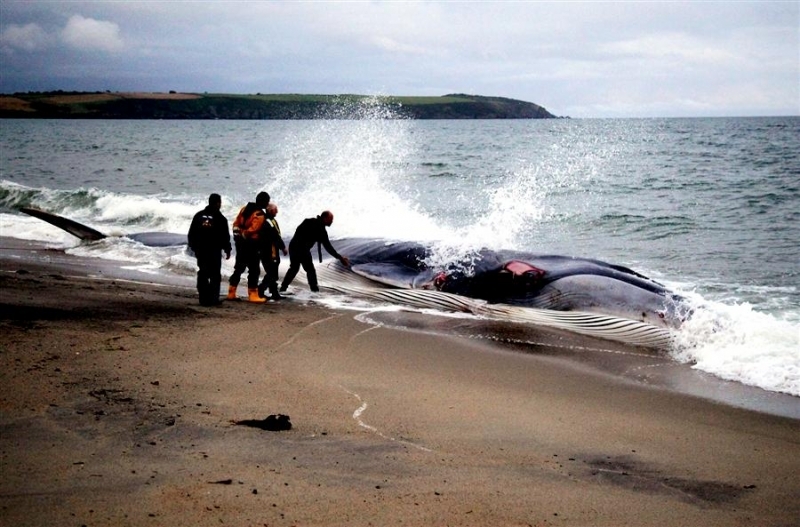 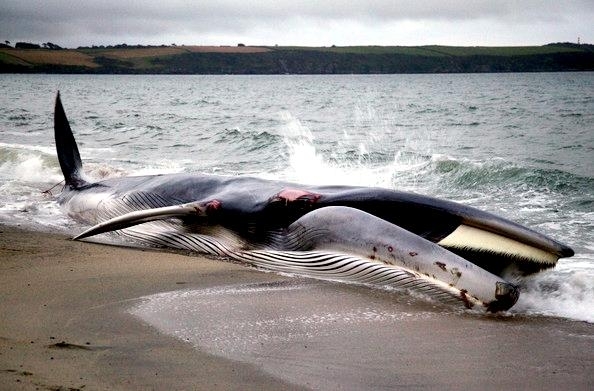 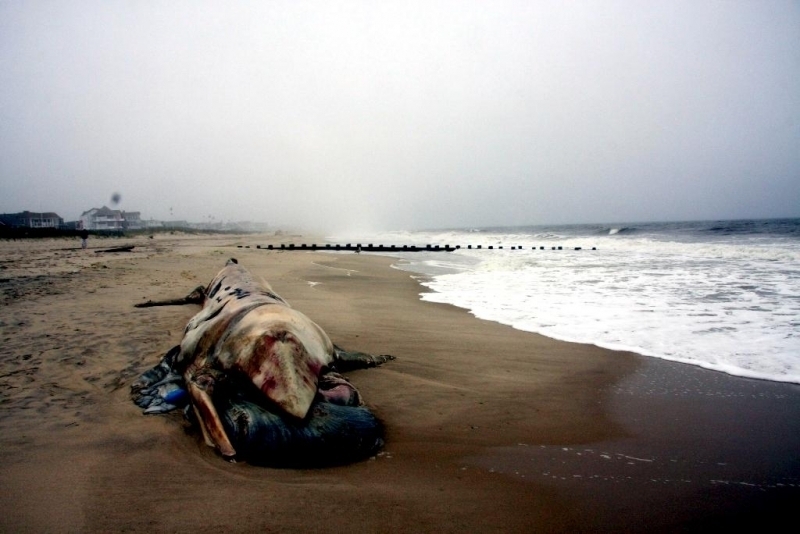 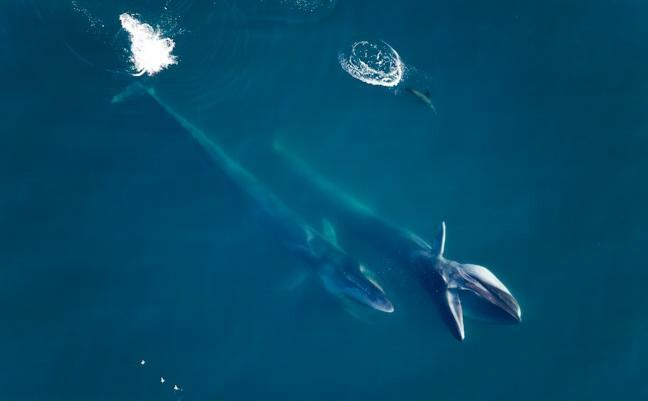 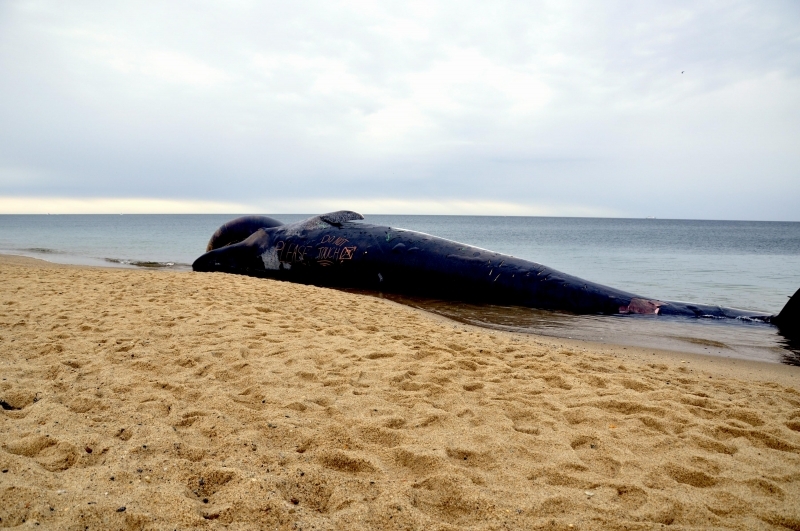 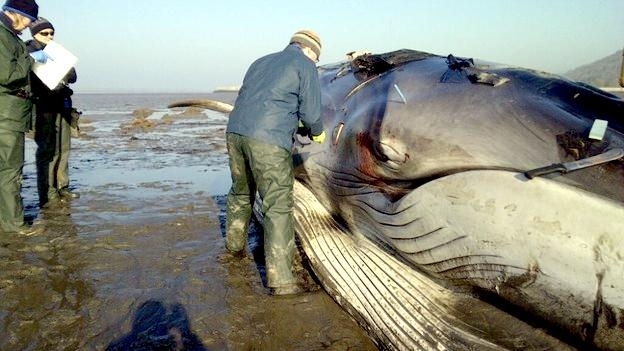 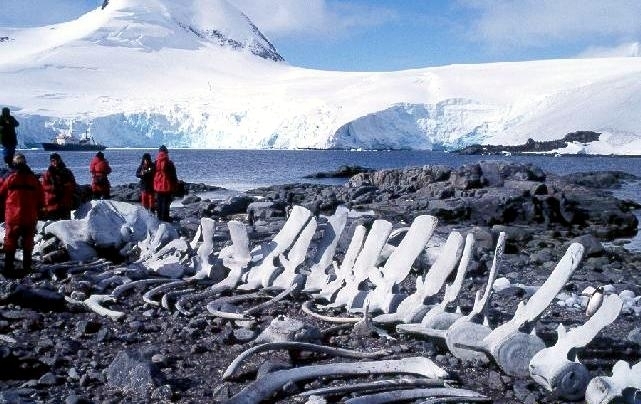 They may migrate to subtropical waters for mating and calving during the winter months and to the colder areas of the Arctic & Antarctic for feeding during the summer months although recent evidence suggests that during winter, Fin Whales may be dispersed in deep ocean waters. 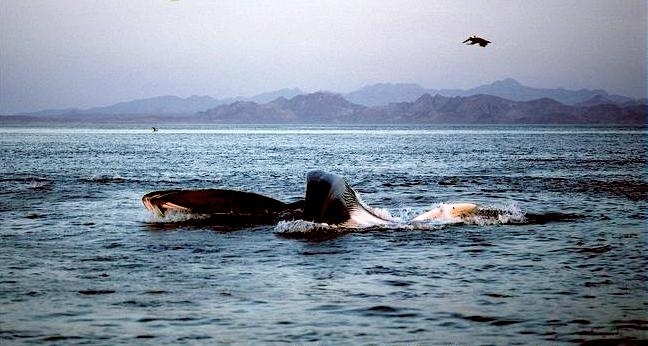 They are found most often alone, but groups of 3-7 individuals are common and association of larger numbers or concentrations may occur in some areas at times. 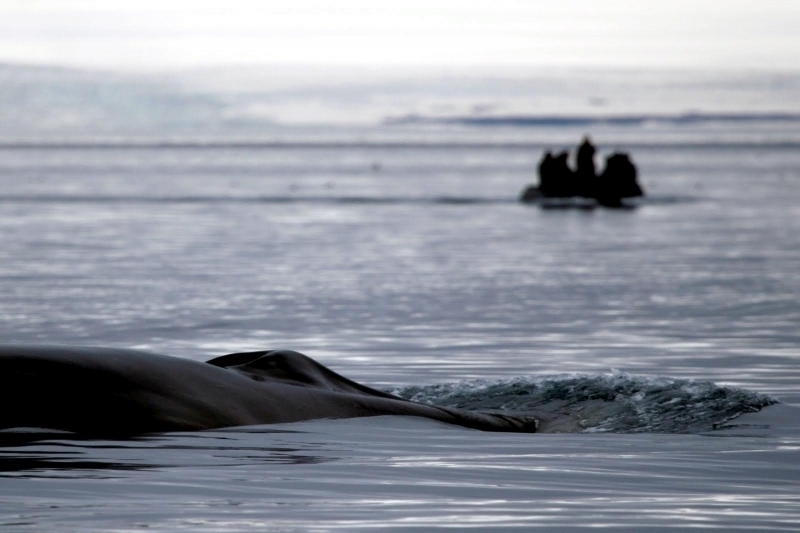 Because their powerful sounds can carry vast distances, they may stay in touch with each other over long distances. 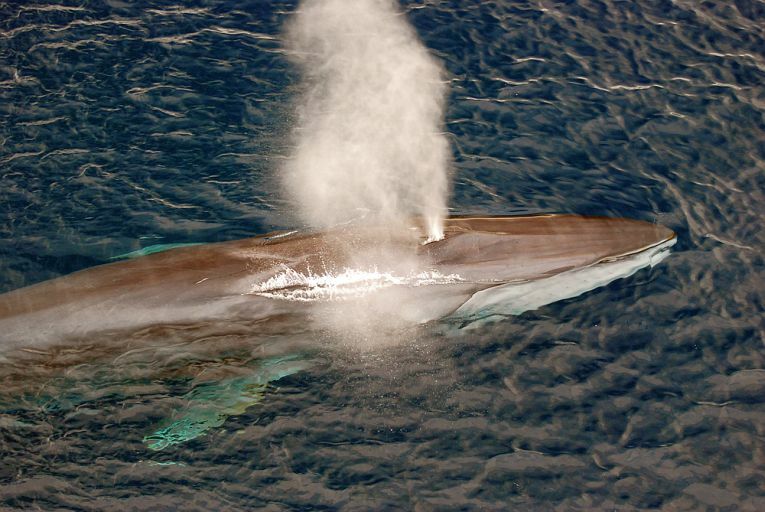 The Fin Whale’s blow is tall and shaped like an inverted cone and the dive sequence is 5-8 blows approximately 70 seconds apart before a long dive. 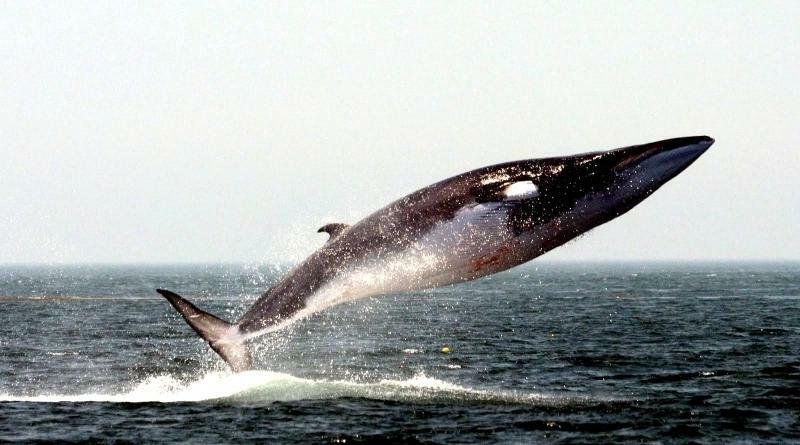 They rarely raise their flukes as they begin their dive, which can be as deep as 1,800 feet. 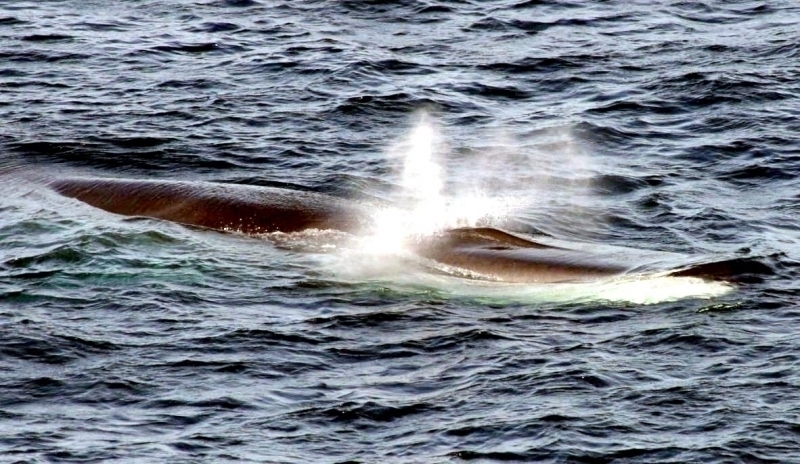 The Fin Whale’s speed plus the fact that they prefer the vastness of the open sea, gave them almost complete protection from the early whalers. 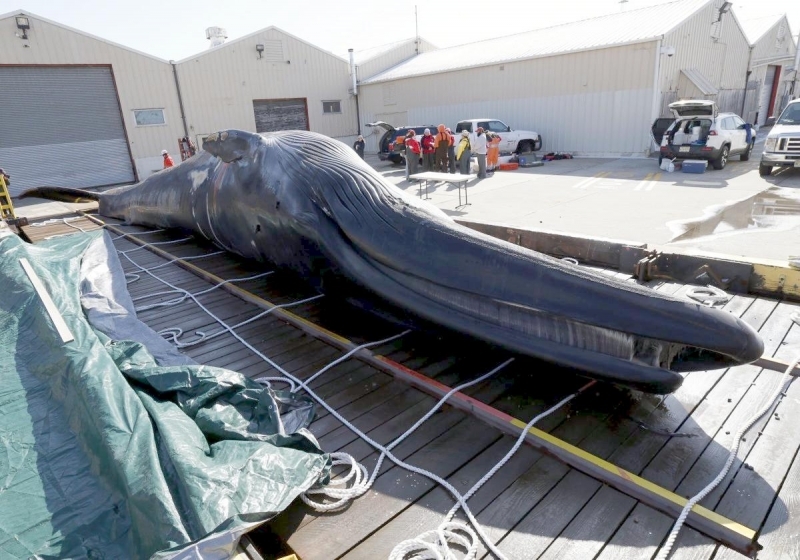 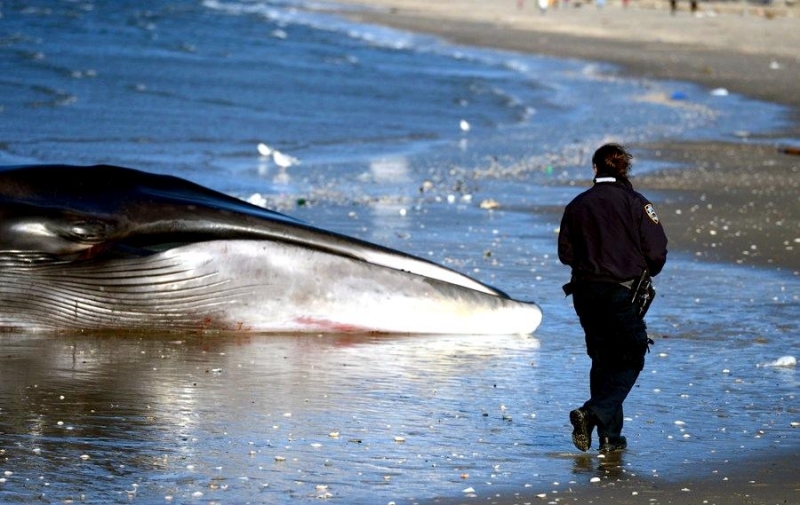 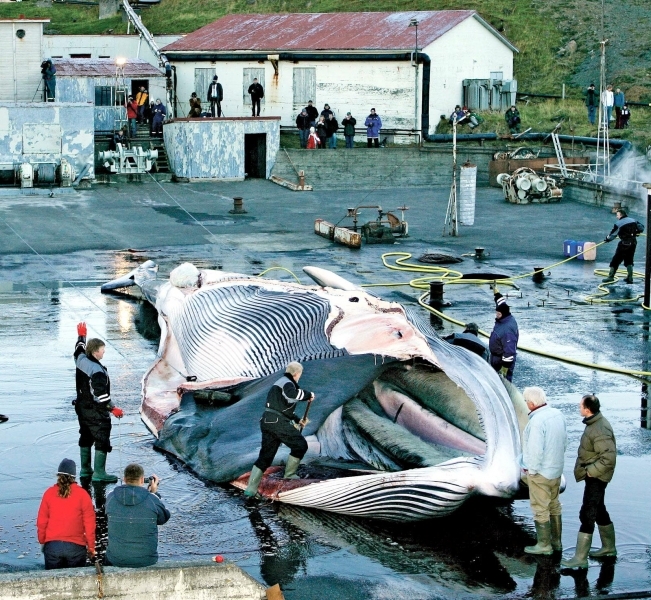 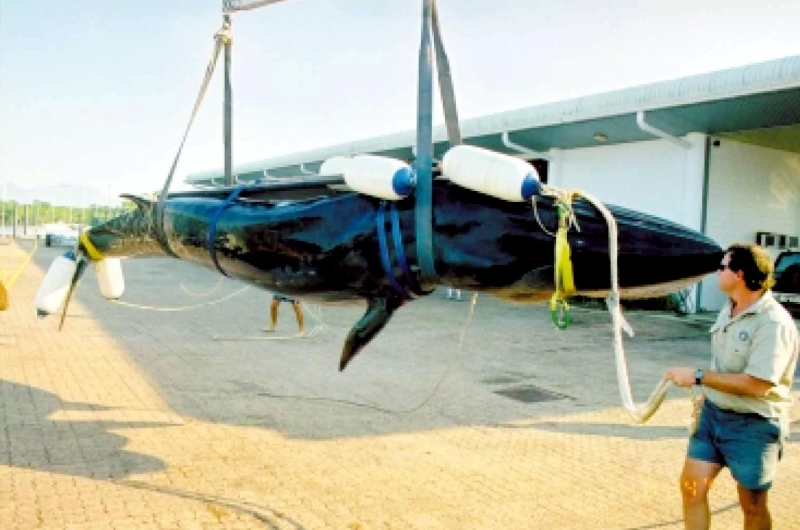 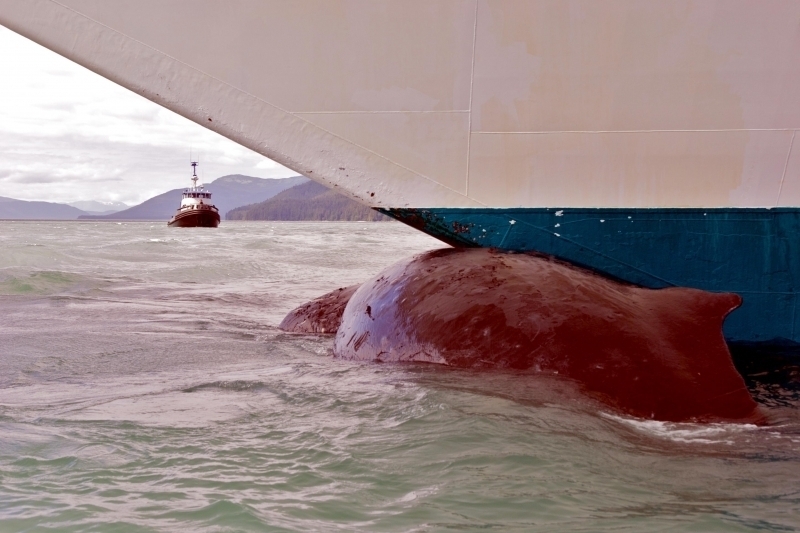 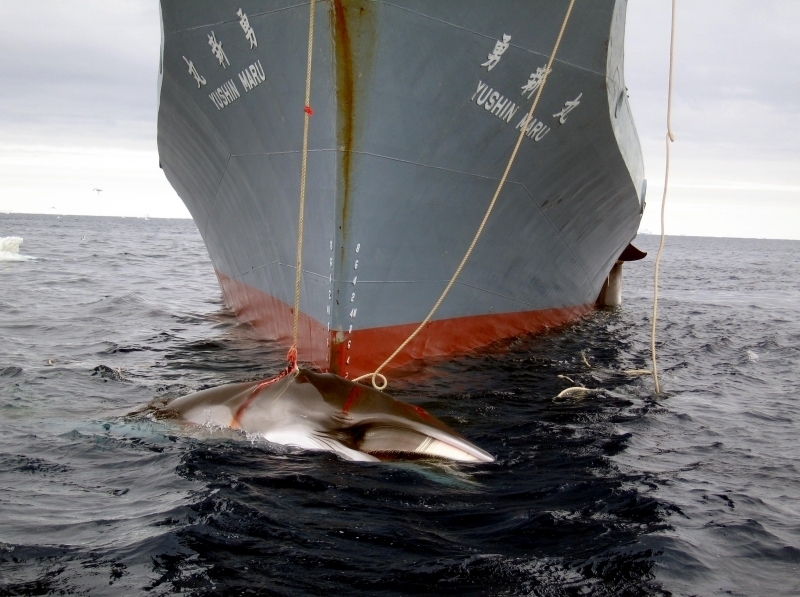 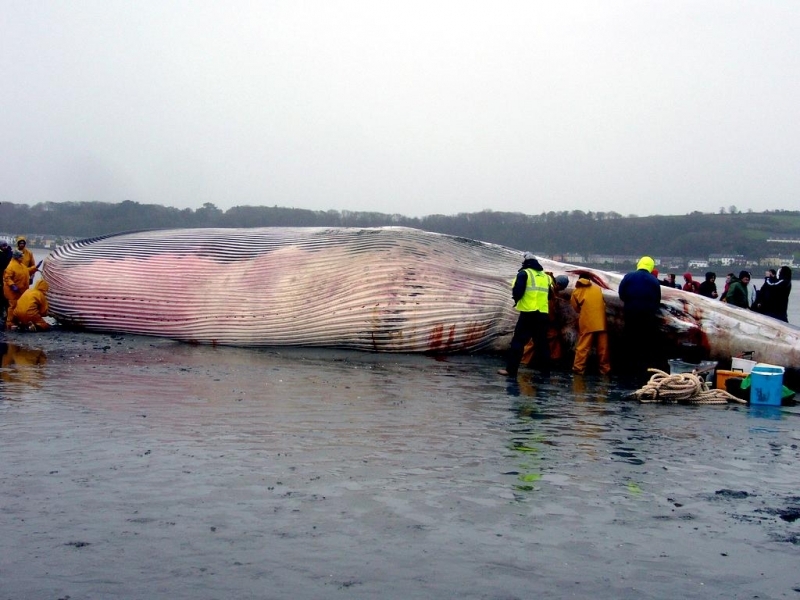 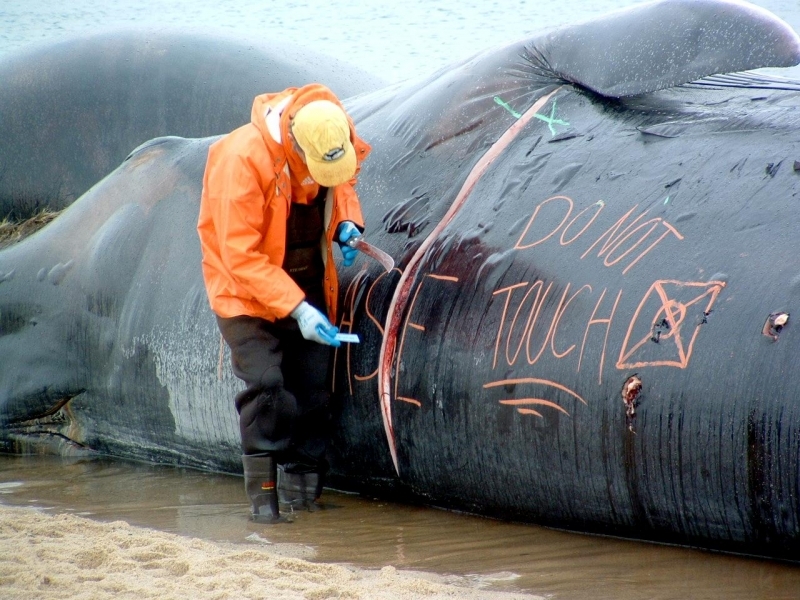 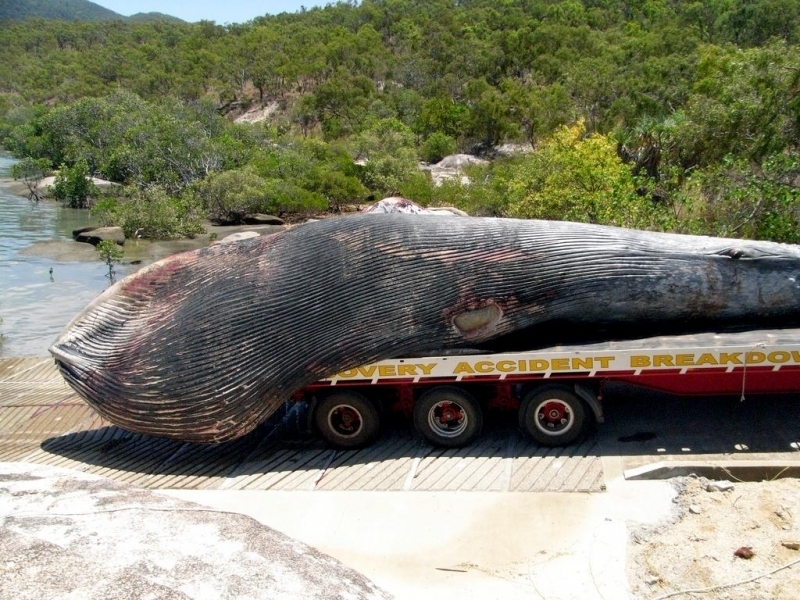 With modern whaling methods however, they became easy victims. 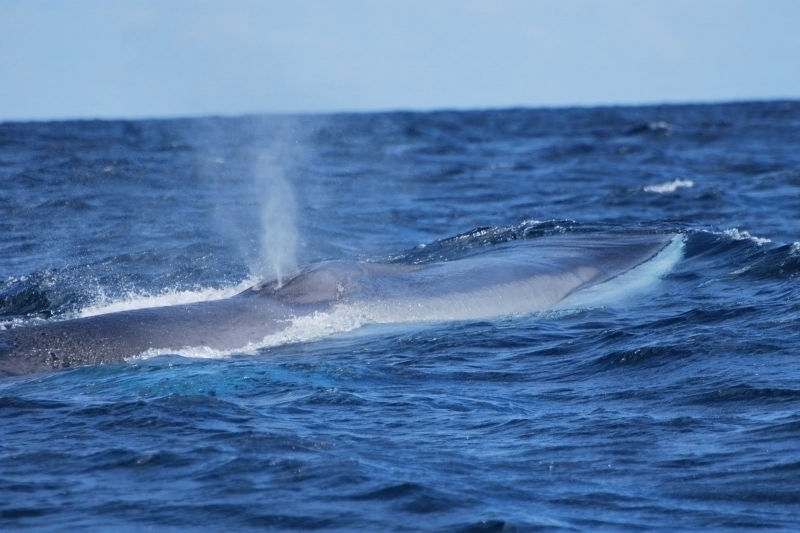 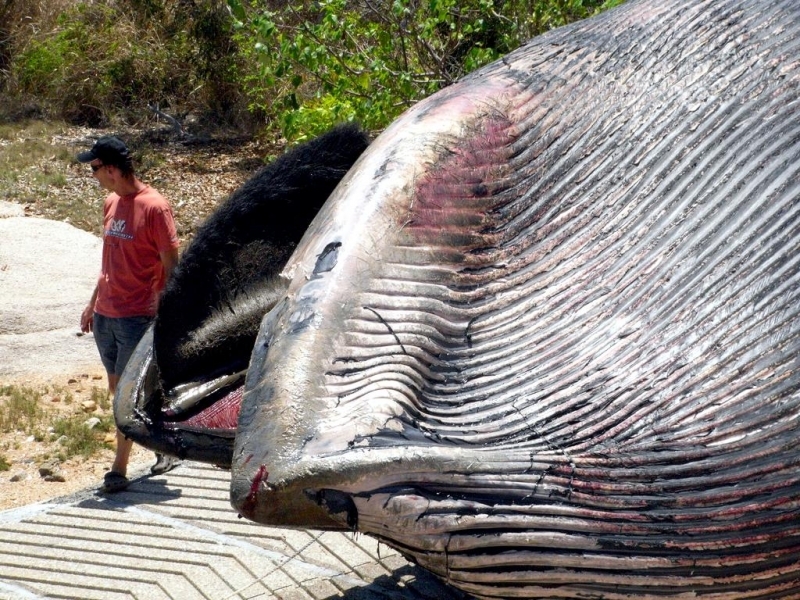 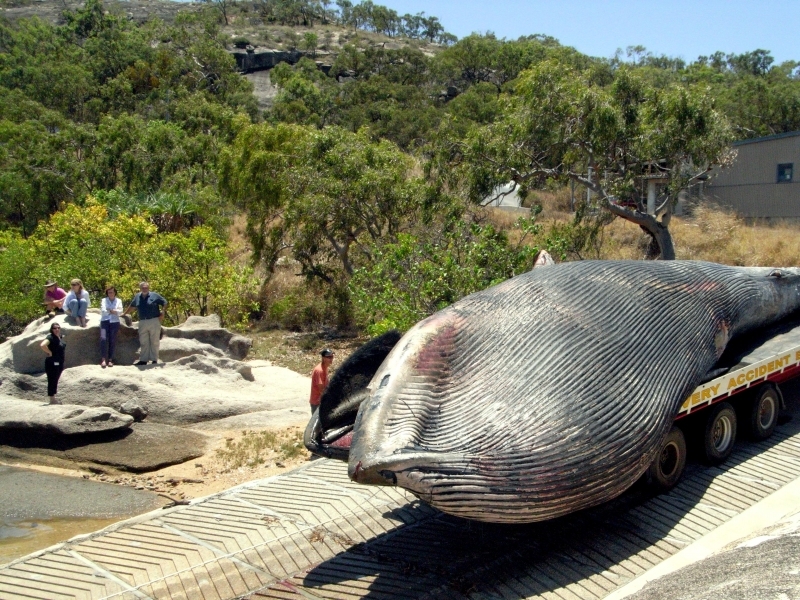 As Blue Whales became depleted, the whaling industry turned to the smaller, still abundant Fin Whales as a replacement. 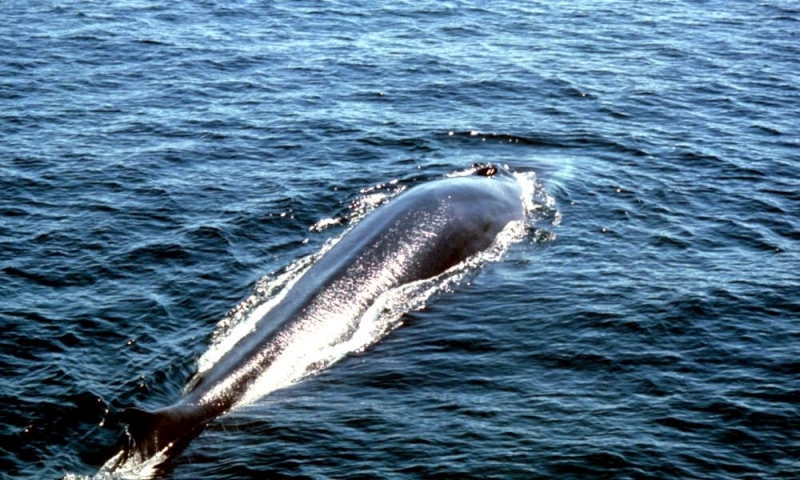 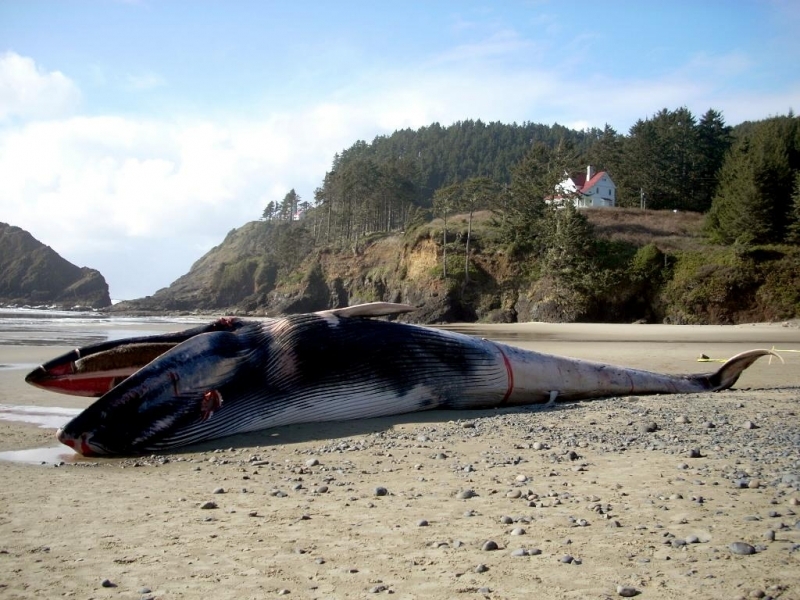 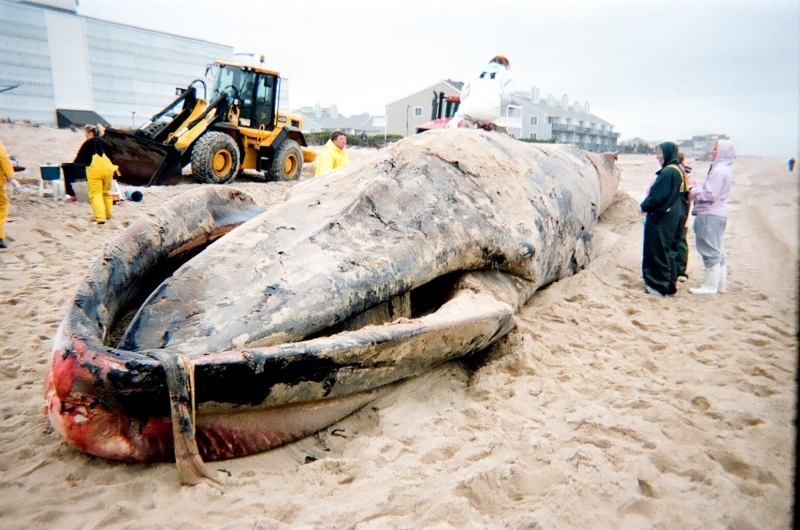 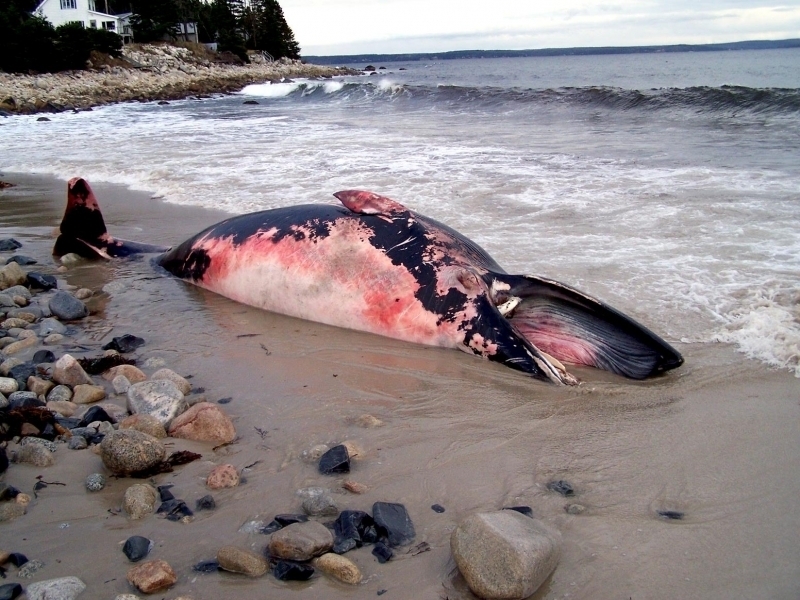 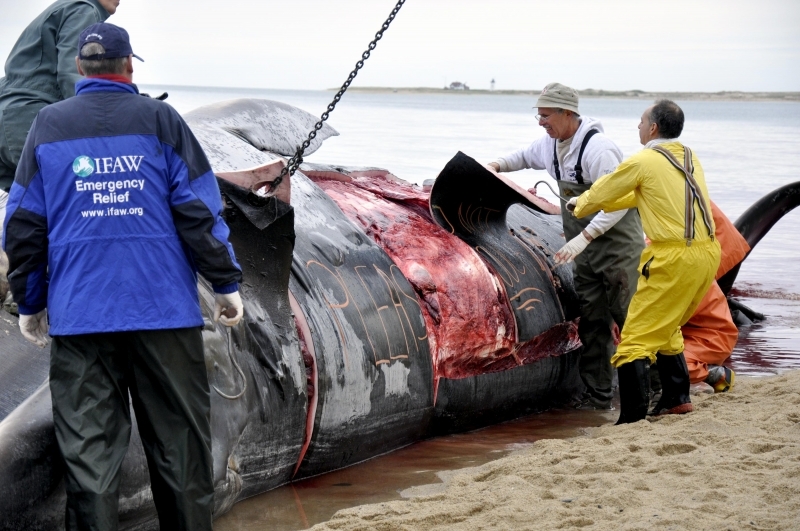 As many as 30,000 Fin Whales were taken each year from 1935 to 1965. 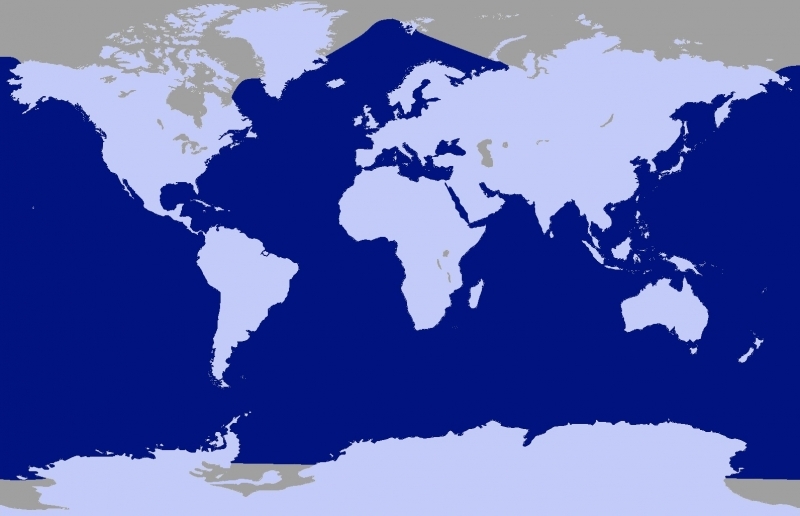 The International Whaling Commission (IWC) placed them under full protection in 1966 beginning with the North Pacific population. 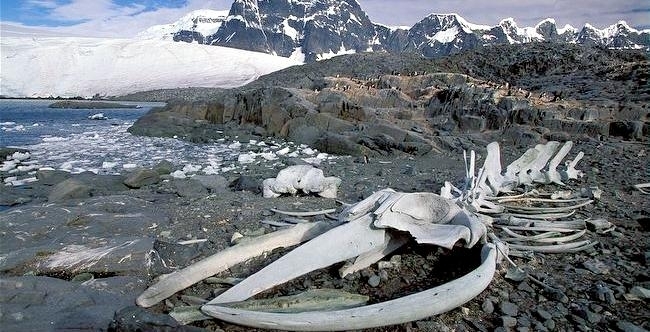 Precise estimates are unavailable today, but it is thought that present populations are about 40,000 in the northern hemisphere and 15,000-20,000 in the southern hemisphere, a small percentage of the original population levels.